What else counts in times of reconstruction than L.O.V.E. ? 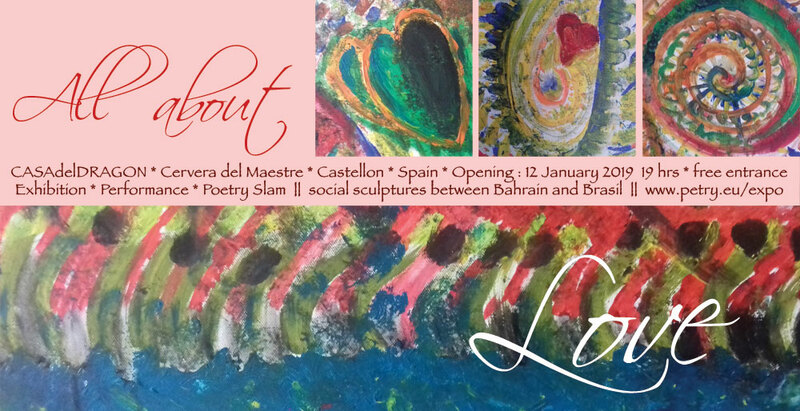 The european artist Juan Petry invites in the gallery of the CASAdelDRAGON in Cervera del Maestre and shows a selection of artworks created from creatives from Bahrain, Brasil and many other countries. All artworks are available, but not for FIAT money! If you want to buy one of this artworks you have to donate some social activities (like planting a tree, a lecture, a live music gig – details in the very special price list). This entry was posted in Exhibitions, Uncategorized on 2018/11/23 by admin.